Take advantage of the many shopping and eating options in Oregon, as it is one of the few states that has no sales tax on goods and services. Portland is noted as one of the most environmentally friendly cities in North America. The city is the largest in Oregon, and known for having many parks, bridges, bicycle paths and the many eco-friendly coffee shops and microbreweries. 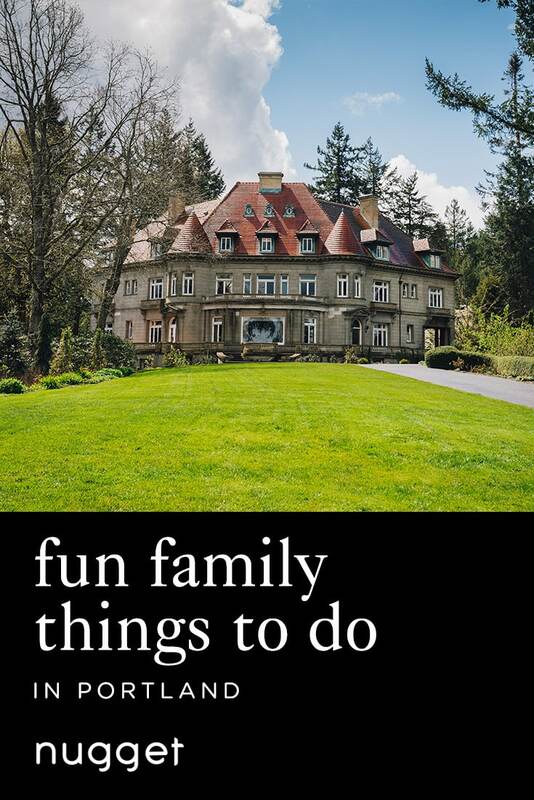 This family-friendly itinerary includes lots of fun family things to do in Portland and explores a few of Portland’s prominent neighborhoods at a leisurely pace. Start your day with a fun stroll through Nob Hill, one of the most charming little neighbourhoods located northwest of downtown Portland. The streets are lined of Victorian style storefronts with modern and eco-friendly interiors. Take the time to explore the many unique and sophisticated shops that cater to all age groups. The neighborhood will also delight the foodie in you with a variety of unique dining options. Stop for lunch at Pepino's Mexican Grill for the best fish tacos you’ve ever had. For dessert head to Salt & Straw, the most popular ice cream shop around. Afterwards, drive to Pittock Mansion for the the best skyline views at this historic mansion. Finally, end your day with some retail therapy at Pioneer Place Mall. Oregon has no sales tax! Pepino's offers a great selection of Mexican food with generous portions at an affordable price The restaurant is highly recommended by locals and gets busy during peak hours. The space may be a little tight for strollers, but there is also ample space available in their patio area on warmer days. We really enjoyed their fish tacos and the kids loved their cheesy chicken quesadillas. All the ingredients were freshly prepared and cooked to perfection. I would recommend this restaurant for anyone looking for a quick and affordable place to eat. DIRECTIONS Located northwest of Portland in the trendy neighborhood of Nob Hill. Street parking is available. TIP Patio seating is available outside if the dining area is too busy. Salt & Straw has the most highly sought after ice cream in Portland. All their ice cream is handmade using only natural dairy products and local organic ingredients. The shop has a simple, modern and eco-friendly vibe to it that I really admired. My kids are big on chocolate so they tried the chocolate gooey brownie and truly enjoyed every last bite. There was such a unique selection of ice cream flavors that I couldn't decide one, so we asked to try their most popular flavor, which was the sea salt with caramel ribbons. I loved the salty and sweet combination and the texture and richness of the ice cream. DIRECTIONS After having lunch at Pepino's, enjoy a leisurely stroll to Salt & Straw, which is a short walk two blocks south. On the way, visit some of the fun and eclectic shops in the area. Nob Hill offers a variety of stores that caters to all age groups from young to old. TIP It’s best to visit during off-peak hours as there could often be lines. They also offer monthly flavour specials. If you don't want a big portion, you can split a scoop and ask for an extra cup and spoons. Pittock Mansion was established in 1914 and sits atop a hill, overlooking Portland. This charming mansion has a lot to offer for those individuals looking to have insight into the history of Portland, Oregon and the many historical transitional changes they have encountered throughout the years. After exploring the mansion and the surrounding area, head to the the backyard as it offers the best view in town of the Portland skyline. On clear days, you may get lucky and catch a glimpse of the infamous Mt. Hood in the distance. DIRECTIONS Pittock Mansion is just a 12-minute drive from the Nob Hill district. Parking is free. TIP Check the website for hours of operation. If you do not wish to tour the mansion, the viewpoint is free to access by the public. With Oregon being one of the few states in America that has no tax on any goods and services, shopping was definitely a must! Pioneer Place Mall is situated right in the heart of downtown Portland's business district. For those short on time and looking for a little retail therapy, this mall and the surrounding area has plenty to offer in terms of clothing shops, souvenirs and electronics (An Apple store is located right across the street from the mall). There are also a variety of local restaurants and eateries to satisfy your hunger. DIRECTIONS A 15-minute drive from Pittock Mansion. TIP Parking is available in select garage locations. Check out the specialty store at the Pioneer Mall called Made in Oregon for a selection of unique gifts and souvenirs all made in Oregon.